Previously known as Lac Royale. As you will see a lot of work going on here but we are getting there. The lake is 4 hectares in size has 9 pegs one is private and out of bounds . Although there are 8 pegs to fish I usually only have a maximum of 6 anglers(Possibly more if you talk to me ) . The lake already contained 400-600 fish . 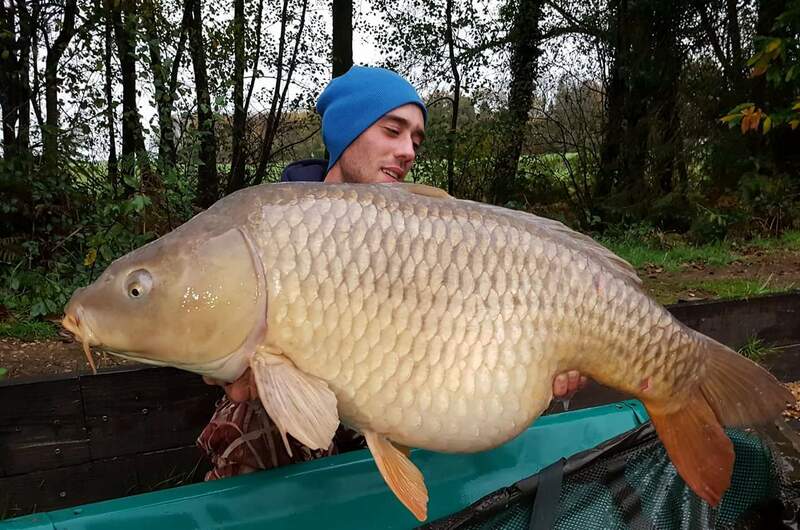 We also moved 120 fish from my old lake most over 35lb and they are now in lac Charmant. We have sold over 100 fish under 35lb. The average weight caught each week is 40lb+ . The lake contains mirrors,commons,leathers,linear,fully scaled,and a few grass carp appearing. We really have no idea what the biggest fish is in the lake .we have been here 3 years now but not been able to drain the lake. We keep getting surprises . I am the only one tagging the fish and we have still to do a lot of fish . In total we have had 6 new unknown 60s out. And still some of the big negreloube fish have not appeared. Most that have been moved and caught have put over 10lb+ on which is fantastic. The lake has an average depth of 6ft ish and the fish fight very hard. Particles and boilies can be purchased at reasonable prices. An exclusive booking can be for a limited number of anglers if you wish.